I thought it would be neat to have a thread for GM's to post various ideas, rule tweaks, NPCs, adventure ideas, and what not--a single thread that a Conan GM can peruse and maybe find ideas for his game. So, I started this thread. Consider it a Conan RPG magazine of sorts, covering all sorts of topics in which a Conan GM would be interested. I'll start, with a few ideas of my own. Feel free to add your two silvers. Last edited by Supplement Four on Mon Sep 24, 2012 3:43 am, edited 3 times in total. What Does A Level Mean? The Conan RPG is written to be played at the lower levels (unlike some other d20 variant games). Half the game universe's NPCs should be in the 1st-3rd level range. See THIS POSTfor examples from the 2E Core Rulebook that speak to this point. 1st level - a novice fresh out of basic training. 2nd or 3rd level - most seasoned NPCs. 4th level - a cut above. The elites. A leader of a bandit band or the fiercest warrior of a band of pirates. 8th level - legendary character. Clan chieftans. Infamous sorcerors. Army generals. Warriors of great renown. 12th level and greater - True mythical characters, as with Conan, Thoth-Amon, Thulsa Doom, Xaltotun, Akivasha. Also note page 301 of 2E Conan. The majority of a kingdom's military forces are 1st level Soldiers. Lower-ranking officers are 2nd-5th level Soldiers. Higher ranking officers are usually Nobles or Noble/Soldiers multiclassed. Peasant militia are usually 1st level Commoners armed with war spears. Last edited by Supplement Four on Fri Jan 31, 2014 9:22 pm, edited 1 time in total. 99% of all supplements written for the Conan RPG were published by Mongoose. But, not all know that Misfit Studios created three OGL supplements designed to be used specifically with the game. I highly recommend all three. Click on the link above to view them. This is a multi-part adventure, written by Eric Rodriguez and Vincent Delarge, that appeared in a magazine called Ancible. The mag now has this adventure downloadable for free. Go to the Ancible download page and download issues #2-#5 to get the entire adventure. tHERE IS NO ENDING (whoops) at article 5? Am I wrong? Spectator wrote: tHERE IS NO ENDING (whoops) at article 5? Am I wrong? It looks like the ending, Chapter 6, is presented in issues #4 and continued in #5. #5 describes a chase and quicksand but is mostly NPC details. I haven't read the whole thing, though. Is there something missing? Yeah. the getaway section appears to be left out. Spectator wrote: Yeah. the getaway section appears to be left out. I looked at it again. I think the adventure is complete. Exactly what do you think is missing? If you comb the Conan posts of this forum, you'll find several fan-made scenarios, outlines, and adventure ideas. For my own compaign, I've got a long development thread (and idea thread, really), and other posts about my game. THIS PAGE is a good place to start. And here are a few examples of what you can find in this forum: Canyon of the Faceless Ones, Prelude to Adventure, and The Dreamer of Lies. Look around. You'll find other neat stuff amongst these pages. Stuff like this can be great fodder for a GM. You never know what with strike a flame of creation in the GM's brain. Take these ideas and run with them. Develop them further. Make them your own. Stuff like this is sometimes a better place to start rather than on the blank page. There are a few web sites out there in the ether with some home grown Conan adventures on them. You'll have to use your Google-fu. For example, there's stuff on Thulsa's site. Some of these are full adventures that you can download for free. Some of these are conversions of classic 1st edition AD&D adventures where you still need the original adventure, but Thulsa provides the Conan-ization. And, some of these Thulsa charges (worth it--he writes good swords & sorcery adventures) for--they're not specifically for the Hyborian Age, but they're close enough that you can customize them for your game without too much fuss. You can buy the pdf or a hard copy through Lulu (which is what I prefer). The Spider God's Brideis a great bargain, providing you 10 adventures, from level 1-10. If you buy it (recommended), then be sure to download Thulsa's free Conan RPG conversion document he wrote for converting that compilation of adventure to the Conan RPG. Besides Thulsa's page, keep on Googling. You'll find stuff like Skull's Conan Cult. Scribd.com is a good place to look for homegrown Conan RPG stuff. In just writing this post for you, I found The Isle of Smoking Peaks, This Article, and this Cult. I'm sure there's more if I kept looking (and if you do, post it here so that the rest of us can benefit!). The Snow-Haired Woman is available from RPG Now. Conan author Vincent Darlage maintains THIS SITE and THIS SITE. You might find useful information on blogs, too, like this one. Please post in this thread anything that you think other Conan GM's would like to see. Great job w/ the Google-fu! Some links may appear to be broken, but you can access pages through other parts of the website. I was 30 yrs old in 2003 and out of nowhere I decided to google Conan (not knowing anything about RPGs since I was in my late teens in the early 1990s. I came upon this page and was blown away and found out that they were releasing the rpg in early 2004. This site and the mongoose release allowed me to be a dreamer again. Very neat IMHO. Here's a surviving link to that last Conan Supplement that Mongoose almost released but instead provided to the fans of the game for free. What do you need when you are creating an exciting tale of the Hyborian Age for your characters to explore? You need a plot. Exciting locales and situations. Interesting foes and NPCs. Well, if you think about it, you can get all of that in the various Conan tales. All you have to do, as GM, is pick a story you like and slap some game stats on things as needed. You can pick your favorite Conan short story or novel, your favorite pastiche, even a story from the various Conan comics. That last is especially suited for gaming in that, with the story, characters, and situations, you also get visualizations that can inspire your game. When I read through the War of Tarim story arc in Marvel's Chronicles of Conan, I never stopped thinking of how that story would make for a grand, epic Hyborian Age adventure for my players. The War of Tarim story arc starts The Chronicles of Conan vol. 3 and ends in vol. 4. It's set around the Vilayet sea. A Hyrkanian city-state, called Makkalet on the eastern shores of the Vilayet has stolen the living god (the holy object of the Tarim religion) from Aghapur. Yildz is still king of Turan, and he sends a massed army to besiege Makkalet, led by the crown prince himself, Yezdigerd. The players, of course, will become embroiled in this cluster-joined, topsy-turvey, twisty-misty story. This tale has it all--scheming sorcerers and priests, insight into the religion of Turan, opportunities to use one of the mass battle combat systems from the game, maybe even a chance to use the sea-battle system from the game, backstabbing NPCs, and even an opportunity to bring Red Sonja (you may want to replace her with another PC or NPC) into your campaign. Use each tale in this story arc as its own separate adventure. Put them together, and you've got your campaign. Episode I: Hawks From The Sea, in which the players become embroiled in this mess. The assault on Makkalet as begun! Episode II: The Black Hound of Vengeance, in which the players make an enemy of the crown prince of Turan! Episode III: Monster of the Monoliths, in which the players switch sides in the battle! But, only to be used by the other side! 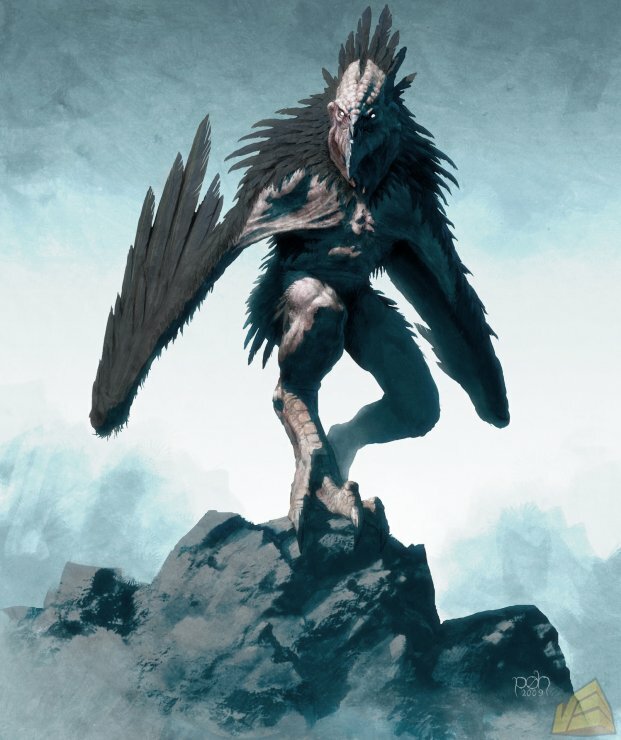 Episode IV: The Shadow of the Vulture, where the players are hunted by the most feared bounty hunter of all the surrounding territories of the Vilayet. Episode V: The Song of Red Sonja, in which the players make an ally of the red haird sword master....or, do they? Episode VI: The Mirrors of Kharam-Akkad, in which the players learn that part of this tale stretches back to the time of Kull! Episode VII: The Hour of the Griffin, in which the players learn about their part in destiny. I'd love to adopt those straight up. We live in a great time for roleplaying as images that will inspire ideas in the GM and provide clarity and detail for your players while the game progresses are just a few Google keyboard taps away. Take the above, for example. Could you come up with a scenario based on this image? Or, how about statting out a new monster based on this image. You describe it, then show this pic to your players as the thing charges them. This is a concept drawing of Tarantia for the Age of Conan MMO, but it could easily serve as another city of the Hyborian Age or maybe the entrance to the mountain keep of Yadda-Yadda. "You've naturally assumed that the creature in front of you is human by its overall shape. But, as you pass, you get a look under the cowl...."
The knight approaches you, blade bare. "Traveller, I said that this road was closed. Turn back. Now." The merchant hands you a strange contraption. You've heard of the weapon but never actually seen one--much less touched one--afore now. You remember that it is called a crossbow. "It is a bow, m'lord," the merchant whispers, "One where you need not pull or knock. You simply aim and squeeze. And this bolt..." You see the merchant pointing to a miniture arrow, "...will fly at your target as if a giant had thrown it." When creating characters using the default method of 4d6, drop lowest, arrange to taste, we sometimes get on a bad rolling streak and end up with some lower than average scores. For example, I just rolled up a Cimmerian for my game, and I ended up with these totals: 14, 8, 14, 13, 11, 8. I actually ended up with a pretty interesting character (I'll post him later in the thread), but when designing him, I had some challenges. Why'd I put the low number, with the -1 modifier, to represent the character's CON? I did this for a number of reasons. As a Barbarian, STR and DEX are quite important for his fighting and defensive skills. WIS is important to cover important skills, like Surivial. And INT is important to provide the character with skill points. That only leaves CON and CHR, both of which are quite useful to the character. But, if I put the "8" in CON, I knew I could make up for the -1 HP penalty by giving the character the Toughness Feat. With that Feat, it's as if the character had no penalty at all. And CON only governs the Concentration skill, which I think this barbarian can live without. Now, CON is also important to the Fort Save, which is used when Massive Damage is applied. I didn't do it, but for the character's second Feat (bonus Feat at 1st level for favored racial class), a player might consider the Great Fortitude Feat. Later on, the character may improve CON at 4th level and again at 6th as the character's stats improve normally. The point being: If you've got a few low scores to assign when creating a character, you might consider putting one of them into CON (as low as "8") then side-stepping the CON penalty to hit points by using the Toughness Feat. Last edited by Supplement Four on Sat Sep 08, 2012 9:51 pm, edited 2 times in total. Interesting, I rolled up an incredibly mediocre Vanir (using 4 d6) and came up with almost the sem rolls I ended putting his 8 in his constitution so I could score the +2 bonus, so i would not have any negatives. I absolutely hate having low charisma and low wisdom characters. IRL those people end up homeless, LOL. PROFECIENCY FEATS: Simple Weapon Proficiency (All), Martial Weapon Proficiency (All), Armor Proficiency (Light), Armor Proficiency (Medium), Shield Proficiency. BARBARIAN FEATS: Track, Two-Weapon Combat, Endurance. 1ST LEVEL RACIAL BONUS FEAT: Power Attack. 3RD LEVEL FEAT: Two-Handed Power Stroke*. *This feat is found in The Barbaric Warrior supplement. It requires STR 15+ and Power Attack, and the benefit it brings to the character is that it allows double STR bonus applied to damage when using two-handed weapons (normally, 1.5 times STR bonus is used). ABILITIES: Versatility, Bite Sword, Crimson Mist, Trap Sense. CLOTHING: Wears a billowy Cimmerian leine and a deer skin vest to cover his chest and soft leather trews for his legs. On his feet, he wears soft leather knee-high, wool lined, boots. Loin cloth. Thin rope belt for the loin cloth; a waist belt for the trews; and a wide, outer-belt over his leine at the waist. He wears a thin-metal hoop earring made of non-valuable metal in his left ear, and on this hoop slides two teeth--one from a wolf and one from a human. On his weapon hand, he wears a ring made of lacquered tree vine. EQUIPMENT: Cimmerian Mantle on his shoulders. A belt pouch, empty a the moment, is attached to the wide belt that covers his leine. Also attached to this belt is a leather scabbard for his Cimmerian Dirk**. In his hands, he carries Stake, a giant war spear custom made for him by his clan's chief and weaponsmith, Finn Duncohr. **This weapon can be found in The Dagger article of S&P issue 81. Stake is a high quality weapon and thus receives the +1 bonus to both Armor Piercing and Hardness of the standard war spear. This is a heavy, massive weapon made of lacquered and fired Cimmerian oak hardwood. Steel coverings ornament the shaft at intervals, used as an extra step to protect the wood when deflecting blade blows. The entire weapon is decorated in Cimmerian spiral etching. DESCRIPTION & BACKGROUND: Morghun is a tall, somewhat lanky (but well muscled) Cimmerian. He's got long, rough-cut black hair that he usually wears loose, bangs down in his eyes. The first thing you will notice about him are the swirling blue tatoos that decorate the entire right side of his face, from his forehead, down his cheek, past his chin, onto his neck and right shoulder. These tatoos are of the knotted, flowing designs popular among Cimmerians. If you look closer, you will see that he is blind in his right eye. A white, clouded orb stares back at you. The tattoos cover the multiple scars of some animal attack that must have mauled him in his youth. If Morghun grimmaces at you, you'll see that he's missing a front tooth. Morghun is a member of the Blue Fox clan. He hails from a village at the base of the Eiglophian mountains in north-central Cimmeria. 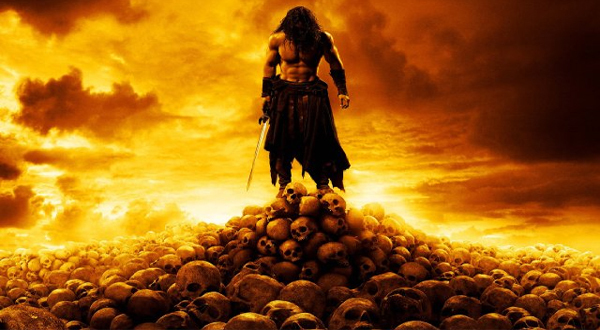 As with all warriors of his clan, he left his village at age 15 on his deasghnath (Cimmerian. Pronounced DEE-as-ga-nath). This is a ritual hunting expedition, performed alone, in which a boy leaves his clansmen and returns to them a man. This is how men become recognized as warriors in his clan. Morghun tracked and found one of the big ice wolves in the foothills of the Eiglophians. The wolf mauled Morghun and nearly killed him, leaving him blind in his right eye and exposing his lung to the elements. But, Morghun persevered and came staggering back into the village, nearly bled to death, carrying the wolf's head. It took almost a season for Morghun to recover. As he lied motionless, unable to move from his injuries, the cold months of the Cimmerian winter crept in and bit deeply into his chest. Spitting up blood and mucus, the wolf nearly killed him again, this time from beyond the grave. Many believed that Morghun would never see summer. But, the lad did. Finn Duncohr, the Foxman's chieftain, declared him to be named "Clanson" as Morghun had displayed the ultimate qualtiy to which all Cimmerians aspire: He never gave up in the face of certain defeat. Finn, a master smith, created Stake and presented it to the new warrior. Finn knew that, with one eye, the boy would have to learn to fight from a distance. Any foe that made his way close, into Morghun's guard, would have an advantage attacking from the side of Morghun's blind eye. The war spear Stake would be used to fight foes from a distance. GM Note: Morghun's injury is reflected in his CON score. I actually rolled his hit points, and as fate would have it, I rolled low for levels 2 and 3 (he was given maximum hit points at level 1 per the game's rule). This also supports the character's injuries and physical state. This character has been given a special -2 circumstance modifier to Spot checks while he recieves a +2 circumstance modifier to Intimidate checks due to loss of his eye and his appearance. In addition, the skill ranks applied to Intimidate have been maxed. Also, a decision was made to max out skill ranks in the Listen skill as those with a visual handicap will usually rely on their other senses to compensate. Morghun coughs all the time. Many times, long coughing fits will result in him spitting up blood. He does not laugh for fear of breaking out into a fit, and he has become quiet. He says little, and this boosts his intimidating bearing. Morghun's father is a leatherworker. Morghun became an etcher, producing the fine, detail work seen on some Cimmerian weapons and leather goods. After he lost his eye, Morghun first turned to jewelry making. In his left ear dangles a metal hoop that pierces two teeth. One is from the wolf that handicapped him, the other is his own front tooth pulled out of his head by that same wolf. Where his cough and eye and face always make him think of the engagement, the earring, with the teeth constantly clinking in his ear, reminds him that the encounter with the wolf was a victory. The ring of woven tree vine that Morghun wears on his weapon hand is the first piece of jewelry he ever produced. In times of late, Morghun has switched occupations yet again. His one eye strains from the demands of etching and creating jewelry, but he has put the skill to use tattooing his fellow clansmen. The tattoos are the same shapes that he used to etch, just on a bigger scale. But, he found that he could not keep food on his plate by relying on tattoos. Recently, Morghun has switched occupations yet again. Since the engagement with the wolf, Morghun has experimented with brewing different concoctions to ease his cough. This has led to him becoming a brewer. His beer is his most profitable seller though its taste and quality is indifferent at best. Of late, Morghun has picked up a taste for gambling though he has no skill in it nor does he understand much about gaming. This is why his belt pouch is empty. When Morghun gambles, he does it for the thrill. He doesn't place a high value on coin or other valuables. If he wins a coin, he's just as likely to pierce it and turn it into a necklace with a piece of cat gut then he is to spend the money. In sum, Morghun Clanson is a tall, forboding figure. Quiet. Leering at you with his one good eye. Scratch scars and swirling tattoos covering half his face. And, that long, obviously well made war spear in his grip. That is, until he smiles at you, his front tooth missing, proffering a leathern jack of his latest brewed beer of questionable quality. GM Note: Though shallow on hit points, this character can be quite offensive in battle. He will strike with Stake, doing 1d10 +6 damage if he hits. He can use Power Attack to increase damage, if necessary. And, Stake is considered a finesse weapon (with an improved Armor Piercing rating of 3), should Morghun combat heavily armored foes. At the beginning or end of his turn--whichever is appropriate--he will use his 5 foot step to increase range to 10' in order to bring Stake to bear on his opponent. Morghun rarely relies on his dirk as a weapon, using more as a general knife and hunting tool. Although I didn't give the character any armor, I sure thought about it. I would make this a game goal. This character, gaining a chain shirt, even, would go a long way towards his surivival. Something quick and immediate might be a simple leather jerkin. Some Cimmerians tend to shun armor, though. Thus, this is what I've done with this character. I'm sure he could change his outlook, the way Conan did, once he learns more of the civilized south! Last edited by Supplement Four on Sun Mar 31, 2013 8:53 pm, edited 5 times in total. Spectator wrote: I absolutely hate having low charisma and low wisdom characters. IRL those people end up homeless, LOL. I'm with you on the CHR. It's important. But, think about it. The avearge human CHR score is 10. A -2 is a standard modifier. Thus, a CHR 7 really isn't that low. If someone is just below average in personal power, they'd be reflected in the game with a -2 modifier. I bet you know a lot of people like this in your life--people, for whatever reason, that do not particulary draw others to them. Look at that old John Hughes movie, The Breakfast Club. I bet at least some of those characters have a CHR 7 with the -2 modier, certainly the "geek" and the "wierd chick". I could see "the geek" as a CHR 8 character, with a -1 modifer, and the "wierd check" with a CHR 6 or 7...a -2 modifier. Mathematically, a -2 modifier means that the character is only 10% less likely to achieve a throw than a normal, average person. When I slapped that CHR 7 on that barbarian above, it seems very appropriate, especially given the background I gave the character. Also, remember that the six stats that defines every character in the game are, by necessity, very broad based. The CHR score reflects the characters personal power in a broad sense, on average. Certainly, the character's close friends and family members might not look at him that way. In the game, this would be reflected by circumstancial modifier (maybe a +4 or more for a close family member?). Remember, too, the Reputation rules in the game. These rules create modifiers to a character CHR score. Hostile: -4 to CHR checks. Unfriendly: -2 to CHR checks. Indifferent: +0 to CHR checks. Friendly: +2 to CHR checks. Helpful: +4 to CHR checks. Let's look a little closer at the CHR 8 Barbarian I created above. Let's say that he's trying to convince Finn, his clan chieftain, about this or that, and the GM has decided to figure the outcome on Morghun's CHR throw. -2 for base CHR score. +4 because Finn is Friendly towards the character. +1 bonus due to Morghun's Reputaton score. +7 to the CHR throw. That's a pretty good modifier, and it reflect the relationship between Finn and Morghun. -2 because the guard is Unfriendly towards the character. -4 circumstance modifier because the guard has been ordered not to open the gates past dusk. +0 Allegiance because Morghun has not allegiance to this town or this guard. +0 Reputation bonus because, using the Reputation rules, the distance modifier has reduced Morghun's Reputation bonus. CHR checks should be a fluid thing, based on the situation at hand, and the game rules allow for that (even if you don't use the modifiers I suggested for NPC attitude). The above shows two widely different probable results based on a number of factors, not just the characters base CHR modifier. Really, looking at the modifiers, CHR 6-7 and CHR 8-9 are just below average--these are those people with quirks about them that, in general, doesn't attract others. But circumstancial modifiers can even make these characters quite persuasive, because everybody has friends and family and those that they influence. Charles Manson would be given a low CHR stat, but within his click, his bonuses made him quite influential.